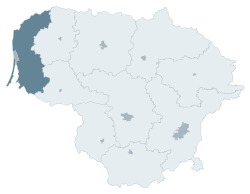 Klaipėda County (Lithuanian: Klaipėdos apskritis) is one of ten counties in Lithuania. It lies in the west of the country and is the only county to have a coastline. Its capital is Klaipėda. On 1 July 2010, the county administration was abolished, and since that date, Klaipėda County remains as the territorial and statistical unit. ^ "Counties within Lithuania - weather and maps", TravelsRadiate, accessed Feb 15, 2011. ^ "Dėl apskričių viršininkų administracijų likvidavimo". Seimas of the Republic of Lithuania. Retrieved 21 August 2011.